On April 26, 1986, the worst nuclear accident in history occurred at the Chernobyl Power Plant in the U.S.S.R. (now in Ukraine). A combination of design flaws and a poorly executed safety inspection led to uncontrolled nuclear reactions, a massive steam explosion, and an intense graphite fire that burned for 10 days, destroying much of the facility. Nuclear fallout (about 400x the amount put out by the atomic bomb dropped on Hiroshima) spread across northwestern Europe, and over 100,000 people had to evacuate the area. Cancer rates skyrocketed. The Chernobyl area is still highly radioactive, and has been abandoned by people for over 31 years now, except for the occasional reporter and a few old residents who refuse to leave their homes in the Exclusion Zone. A pack of radioactive wolves prowls the Chernobyl Exclusion Zone. Image by Juan José Gonzáles Vega. What good could ever some of such a catastrophe? The Chernobyl disaster was awful for humans, but the local wildlife is thriving. Because there are almost no people in the area surrounding the power plant, nature has taken over. Despite still having radiation levels 10-100 times higher than normal background radiation, Chernobyl is wild and green, and many animal species have made their home there, including beavers, bears, and birds. The Ukrainian government took notice, and designated the Chernobyl Exclusion Zone as a wildlife sanctuary in 2000. It’s one of the largest nature sanctuaries in Europe. 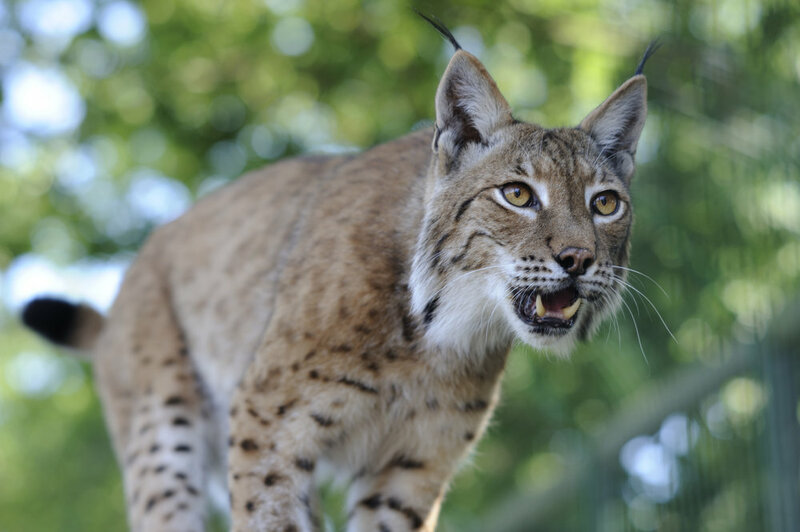 The elusive Eurasian lynx is one of many amazing animals to take over Chernobyl. Image by dogrando. Some of Chernobyl’s most famous residents today are a pack of Eurasian wolves, their fame no doubt due to the appeal of a headline like “Radioactive Wolves!” But there are a lot of other really special animals living in the Exclusion Zone too, like the Eurasian lynx. These wild cats are relatively common, but are extremely elusive, so getting to see one is a rare occurrence – but they have been seen at Chernobyl. Moose, the world’s largest deer species, have been seen with calves (moose may be common in the northern U.S. and Canada, but they’re rarer in Europe). Brown bears forage, endangered European bison graze, and beavers chew down trees – which shapes the landscape to the point where it can accommodate even more biodiversity. More common animals like boars, foxes, storks, otters, and owls have also been seen in the area. Rodents and small birds have found a haven too; there have even been reports of birds nesting in the remains of the reactor buildings. Turns out that not having people around makes things a lot easier for wild animals. 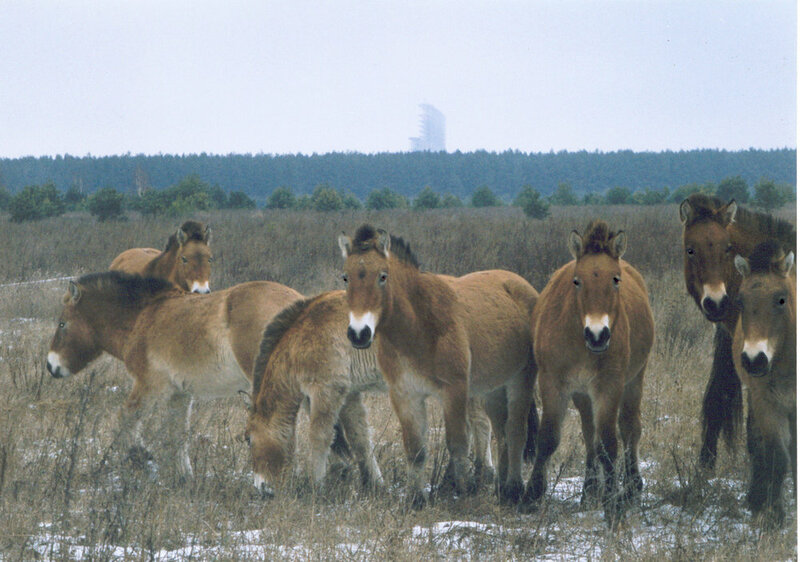 Przewalski's horses in the Exclusion Zone, with an abandoned power plant building in the background. Image by Xopc. Some conservationists are taking advantage of this new wildlife sanctuary. The world’s only true wild horse still living is the Przewalski’s horse (pronounced shuh-VAL-ski), also known as the Dzungarian horse, tahki, Asian wild horse, or Mongolian wild horse. While there are other “wild” horses in the world, all of them descend from domesticated horses – except Przewalski’s horses, which have never been domesticated. Przewalski’s horses are relatively short and stocky, and tend to be a dun brown with a stiff black mane (similar to a zebra’s mane – just not striped). Przewalski’s horses were once declared extinct in the wild, due largely to overhunting and habitat loss, but have made an incredible comeback (although they still qualify as “endangered”. Reintroduction efforts have helped their populations grow, and one of those re-introduction sites was the Chernobyl wildlife sanctuary. Reports indicate that the Chernobyl herd is doing reasonably well – at least for living so close to a giant radioactive junk heap. Barn swallows with physical deformations have been observed in the Exclusion Zone. Image by JJ Cadiz. While the animal populations in the Chernobyl area are doing pretty well, individual animals have suffered the effects of prolonged exposure to high radiation. Radioactive particles can be found in the soil, the plants, and in every single link in the food chain – to the point of being deemed unsafe for human consumption. Some of the effects and abnormalities caused by all this radiation include smaller brains, physical defects, and decreased ability to reproduce. However, these effects are actually relatively minor, and many species have adapted to deal with the high radiation levels. The reason that nature is doing so well at Chernobyl is that there are virtually no people in the area. It’s worth considering the implications here. These animals are a lot safer within a 30 km (19 mi) radius of the world’s worst nuclear accident than they are around people. What does that say about us? You can visit Chernobyl if you really want to, but it’s probably not the best destination for casual wildlife photographers. I’d recommend that you enjoy the wildlife photos and reports of other people instead. You can see some great photos here and here.